I love having a daily juice because it’s a high-boost of minerals and vitamins, and I can use ingredients that I wouldn’t normally put in a smoothie, like fennel, beet, carrot or daikon. Usually I go back and forth with the time of day for a juice, depending on the season and time of year. In winter, I like to start my day with a big fresh juice. In summer, I prefer to start my day with fresh lemon or raw apple cider vinegar mixed with a glass of water and enjoy a fresh juice in the afternoon. 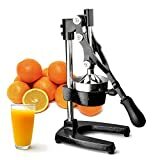 I also use my juicer for a one-day per week juice fast (usually on Sunday). 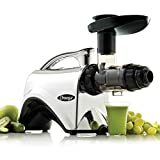 On my juice day, I use the juicer all day, making a fresh juice every 3 hours…and I only clean the machine once, at the end of the day. That saves a lot of time, believe me! 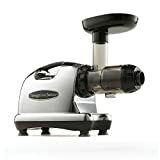 Of course, if I continue on for a 3-day, 7-day or longer juice fast at home, I use the juicer for that too. 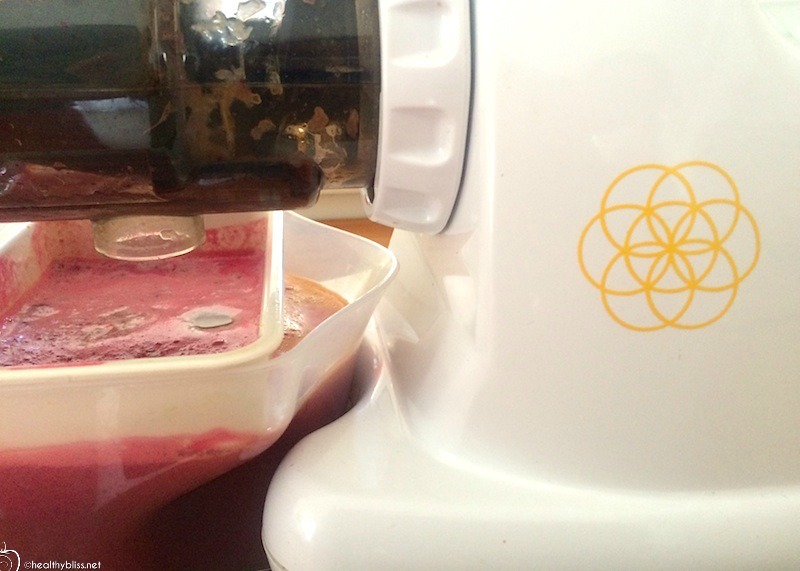 For some extra added energy, I put a sacred geometry sticker on the juicer….as you can see in the picture below. Seed of Life symbol on the juicer, oh yeah! This one is a mandala and it’s the symbol for the Seed of Life. 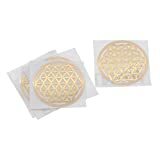 The “Seed of Life” pattern is made of seven interlocking circles. Some people see these seven circles as the seven days in which God created life. First one circle was created and on each further day another circle was added. 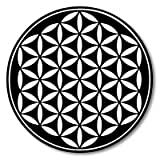 Once all seven circles were formed the seed of life was born. This symbol can connect you with the very heart of all of existence. 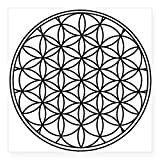 The Flower of Life is another sacred geometry pattern aligned with a powerful positive energy that can be applied to all kinds of positive desires, such as peace, harmony, love, health, wealth or development of creativity. By placing this symbol on my juicer, I like to think that I’m re-connecting the energy of my food/juice back to Source, clearing any toxic energy and infusing a high vibration that is in alignment with my greater good and a Source of Divine Unconditional Love. It may sound crazy, but what if it works? Masaru Emoto showed that the structure of water can react to positive thoughts and words, and that polluted water could be cleaned through prayer and positive visualization. So why not put loving intention into your food with sacred symbols for an added positive intention? Anyway, that’s the story behind the sticker. As a side note to those who are into the 5/2 diet – that’s the UK version of 5 days eating + 2 days fasting per week – try starting with a 6/1 approach instead. It’s more realistic, easier to do long-term and doesn’t set you up for bingeing on your eating days. I’ve seen too many people go from one extreme to the other on this diet in an effort to lose weight, but as soon as they stop, they gain everything back within a week. Small changes add up very quickly over time. Diets of extreme don’t give you lasting results. 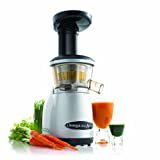 If you’re new to the whole detox, raw food, slow food, organic and healthy living scene, then I definitely recommend you buy a blender first. 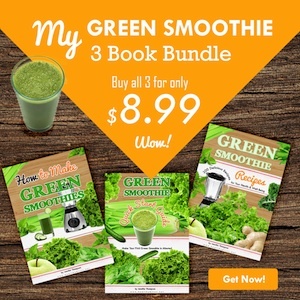 After you’re happily blending green smoothies for a few months or more, you may want to start juicing at home and even start doing 1 day a week of juice fasting as a mini reset or detox. 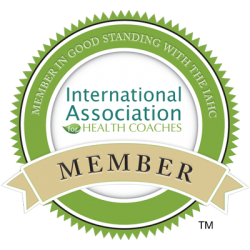 Don’t underestimate the value of 1 day – remember, if you juice fast one day per week, after 7 years, you will have done an entire YEAR or juice fasting. Wow! That really adds a huge deposit in your health, energy and longevity bank. 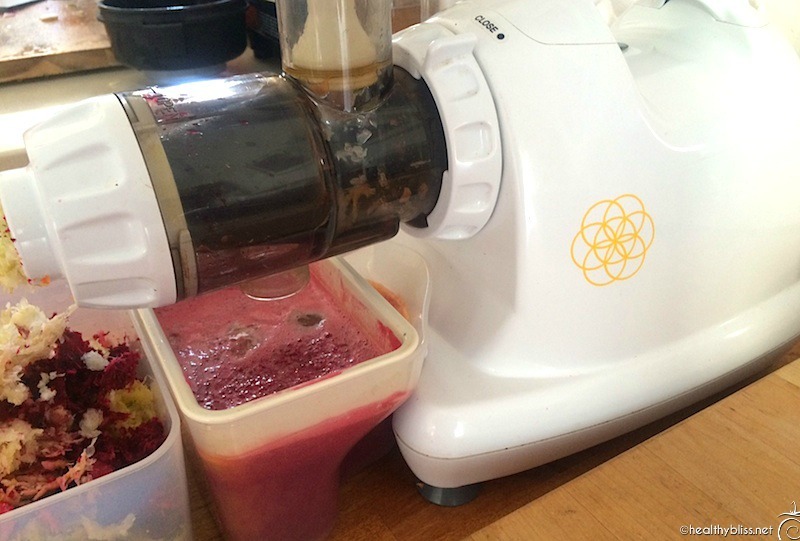 Wondering where to start with juicing? 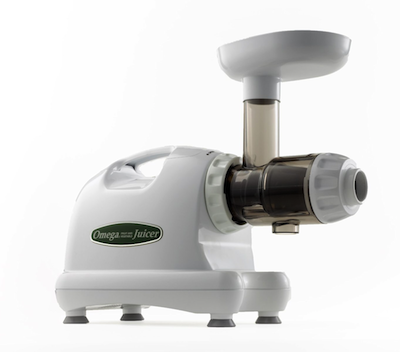 Simply add 1 fresh organic juice to what you’re already doing. You can have a juice for breakfast or as a snack when you come home from work, whatever works best for you. My favorite juice lately is a combo of organic celery, ginger, apple, lemon, carrot and beet. Focus on bringing in more healthy foods and the good stuff will “crowd out” the old foods. Over time, you will naturally crave more healthy foods (yes true!) and you will see your health thrive as a result. I was recently at the Spa and did an Iridology session with you and also came to one of you amazing Monday night talks. Thank you for sharing your experiences, it was inspirational !